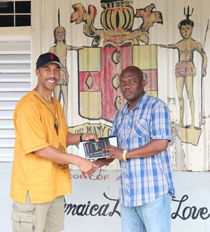 Roy presents an educational DVD of Akwantu to Garfield Rowe, Principal of the Accompong Primary and Junior High School. "Akwantu: the Journey is a scholarly, entertaining, and inspiring film that delivers a message beyond the personal experience of one Jamaican in search of his roots to a compelling and empowering history of an exemplary people!" Action 4 Reel Flimworks is the production company of veteran movie and television stuntman Roy T. Anderson and his wife Alison G. Anderson. The company aims to bring the underrepresented stories of peoples of African descent, such as the Maroons, to worldwide audiences through film and related media. Akwantu: the Journey, the award-winning feature documentary on the legendary Maroons of Jamaica, is the first film project in this series. The accompanying Discussion Guide is designed to encourage and promote dialogue and debate around the film. Roy’s follow up film exploring the Maroon experience in the New World is Queen Nanny: Legendary Maroon Chieftainess, a 1-hr documentary that sheds light on Jamaica’s only female National Heroine. As with his debut film Akwantu, Queen Nanny also comes with a companion Discussion Guide. This film, which has garnered several prestigious awards, and screened on six continents, had its world premiere at the United Nations Headquarters October 19, 2015. While continuing stunt work, Anderson is currently in production on a feature documentary-film on the life of famed Pan-Africanist Marcus Garvey that he is directing and producing alongside Emmy-Award winning actor Keith David who also serves as the film’s narrator. There's no question the filmmaking process is quite expensive, but on a global scale it can have a major impact, which is what we are hoping for in this bold initiative. For our groundbreaking series we rely on financial contributions from individuals, and on grants from charitable foundations and government agencies. Won’t you please consider making a donation to help ensure that our films and related media can reach their full potential as a tool for social change and education? Or you can also make an online donation.